Hello, brothers and sisters in the Lord! Thank you for bearing with me and sticking it out through this 12-week study. I pray that this comprehensive view of Ephesians has opened your eyes and filled your heart with joy after looking more closely at the marvelous plan of God to reconcile and consummate all things in Christ. I hope you have especially appreciated the mystery of Christ and His body now made known to everyone who has eyes to see and ears to hear. After all, as we have seen in this letter, the Father's plan for the Church encompasses our present age, and, having been reconciled to God in one body (Eph. 2:15-16), we are closer than ever to the return of our Savior, the Head of the body, and the consummation of the Age of Grace (Eph. 1:4; 3:2; 5:27)! Week Seven: Bodybuilders in Christ—Exercise Your Gifts! Scattered throughout Paul’s letter to the Ephesians we have seen glimpses of the ongoing spiritual war in the heavenly places (cf. 1:20-23; 2:1-3; 3:10; 4:8-10, 4:27), but now we arrive at the final showdown (6:10-24). Most assuredly, Christ has been victorious over the enemy and proclaims “peace” to everyone who has been reconciled to God through Him (2:14-18); however, the Devil and his dark forces are still proclaiming “war” on the people of God, and so the believer is not yet out of the fight. The supernatural forces of evil seek to derail each believer from living up to their calling (4:1), thereby stunting their maturity and inner renewal (4:14, 4:23)—all with the aim of dividing the body and overturning God’s will to reconcile and consummate all things on heaven and earth through Christ (cf. 1:9-10). Therefore, every believer needs to know how to stand their ground and stay in the fight, because the enemy will relentlessly and ruthlessly exploit anyone who is undisciplined and unfaithful in their walk with the Lord (cf. James 4:6-7; 1 Pet. 5:8-9). In previous sections (Weeks 7–11), Paul has shown us how to walk (i.e. “live”) in a manner worthy of our calling, and in the final section of this study, we will see, more or less, a summary of holy living according to the gospel. Thankfully, as Paul has already alluded to in the letter (1:19; 3:7,16-17, 20), God provides His limitless and incomparable power to the believer in order to overcome the spiritual opposition. Moreover, in 6:13-17, divine empowerment for resisting the enemy’s attacks is identified as God’s own armor—an apt metaphor that describes God’s character and abilities (i.e. His truth, righteousness, peace, faithfulness, salvation, and word). Also, since there is strength in numbers, believers must stick together in this fight, praying for and encouraging one another. Boldness and courage are needed to fight the good fight of the faith, and an undying love for Jesus, the one who died for all, will fuel the believer to resist evil until the end. Paul begins the conclusion of his letter by emphasizing the believer’s dire need for God’s own power and strength to withstand the wicked schemes of the Devil and all of his evil cohorts. Since the spiritual opposition is invisible, more numerous, and stronger than the Christian (Matt. 8:28; Mk. 5:2-5; Acts 19:15-16), the spiritual war cannot be engaged with mortal strength or human reasoning, because “we do not wrestle against flesh and blood…” (6:12). *Also, there are Old Testament prophecies that depict Christ and His armor: see Isa. 11:4-5; 59:17. *Recall Eph. 5:16, "the days are evil," (cf. Gal. 1:4, "this present evil age"). Kuruvilla adds, "The 'evil day' may therefore refer to a present reality marked by specific times of satanic attack that come with extraordinary force and when the temptation to yield is particularly strong" (210). **The Greek word for "schemes" (methodeias) in 6:11 is only found twice in the NT—the other place being Eph. 4:14. Thus, one major facet of "the schemes of the Devil" that believers are to stand against and oppose is false and deceptive teaching, "...every wind of doctrine, by the trickery of men, by craftiness in deceitful scheming [methodeias]." “Paul refers to these hostile beings [Eph. 6:12] in the unseen realm earlier in Ephesians. He wrote that God raised Jesus from the dead and ‘seated him at his right hand in the heavenly places, far above every ruler [arche] and authority [exousia] and power [dynamis] and dominion [kyrios]’ (Eph. 1:20-21). It was only after Christ had risen that God’s plan was ‘made known to the rulers [arche] and authorities [exousia] in the heavenly places’ (Eph. 3:10). These cosmic forces are the ‘rulers [arche] and authorities [exousia]’ disarmed and put to shame by the cross (Col. 2:15). Had those ‘rulers’ [archonton] known that the death of the messiah was necessary for God’s plan to succeed, they never would have crucified Jesus (1 Cor. 2:8).” - Michael Heiser, The Unseen Realm, 330. Therefore, standing firm in light of Christ’s victory, believers must put on God’s whole armor (6:11, 13; Grk. panoplia). It’s not the defensive gear and weaponry itself that’s key to remember; rather, it’s important to focus on what these items represent and signify (i.e. God’s character, words, and deeds). Nevertheless, believers are not to put on some of the armor some of the time—they need the whole armor of God all of the time during these evil days. Notice again, Paul stresses adequate preparation before future attacks, “Stand therefore, having girded...having put on...having shod…” (all past-tense verbs). Thus, the armor of God needs to be “put on” continually, not merely in the spur of the moment or after you’ve been ambushed. Moreover, this humble mindset of daily reliance upon the Lord coheres with the rest of Scripture (cf. Lk. 9:23; Jn. 15:5; 1 Cor. 10:12). *The Greek verb perizonnumi ("to put a belt around; to gird oneself") is often used in the context of preparedness, or readiness for action (cf. Lk. 12:35, 37; 17:8; Acts 12:8). 2. 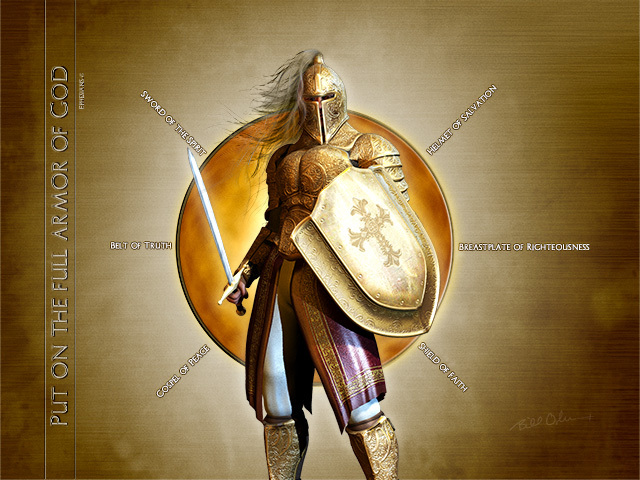 Breastplate-righteousness: Just as the second piece of armor protected a Roman soldier’s heart during battle, so also the soldier of Christ needs to guard his soul by living righteously, “When Satan accuses the Christian, it is the righteousness of Christ that assures the believer of his salvation. But our positional righteousness in Christ, without practical righteousness in the daily life, only gives Satan opportunity to attack us” (Wiersbe, 58). 3. Shoe-peace: In order to gain traction and sure-footing in battle, Roman soldiers put hobnails (metal spikes) on the soles of their sandals. Similarly, the soldier of Christ needs “sure-footing” in the spiritual battle. * The solid-ground of “the gospel of peace” will keep the believer from falling short of the grace of God and stumbling on the battlefield, “It is the believer’s ‘sure-footedness’ in the tranquility of the mind and security of the heart in the gospel of peace that gives them readiness [“preparation”] to stand against the devil and his angelic hosts” (Kuruvilla, 211). *The divine footwear in Eph. 6:15 is the only piece of armor not found in the OT description of the Messiah's armor (cf. Isa. 11:4-5; 59:17). However, the precious feet of those bringing good news [euaggelion, "gospel"] of peace in Isa. 52:7 represent the saving presence of Christ (Ibid., 210). *For OT passages that describe God as a faithful, protective shield, see Psalms 18:30; 35:2; 40:11; 91:4, "...His faithfulness is like a shield or a protective wall" (NET). 5. Helmet-salvation: For a Roman soldier, the metal helmet protecting his head provided a sense of safety and peace of mind while in combat. Thus, the helmet of salvation can refer both to the assurance that God will rescue believers from present attacks (cf. 2 Tim. 4:17-18) and the guarantee of their future deliverance when Jesus returns (cf. 1 Thess. 5:8, “...put on...a helmet, the hope of salvation”). *Wiersbe adds, "Hebrews 4:12 compares the Word of God to a sword, because it is sharp and able to pierce the inner man just as a material sword pierces the body. You and I were 'cut to the heart' (Acts 2:37) when the Word convicted us of our sins" (59). Continuing with the topic of spiritual warfare, Paul transitions from the armor of God, specifically the sword of Spirit (6:17), to persistent prayer in the Spirit (6:18-20). 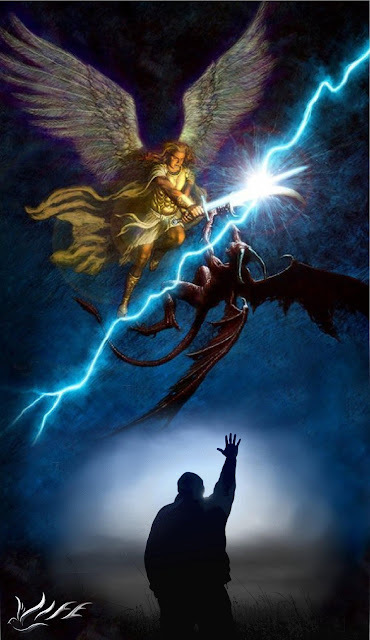 Thus, the word of God and Spirit-driven prayer go hand-in-hand as the believer’s offensive weapon against the relentless attacks from the unseen powers of darkness that Paul exposed back in 6:12, “...the word authored by the Spirit is uttered by the believer to foes, and prayer in the Spirit is word uttered to God. Words to foes and words to God are both necessary” (Kuruvilla, 214). In verse 18 Paul stresses the importance of not only praying for one’s own struggles, but also for others in the body who are engaged in battles of their own, “...praying always with all prayer...with all perseverance...for all the saints…”* Then, in verse 19, Paul asks the Ephesians to intercede on his behalf so that he will continue to speak boldly about the mystery of the gospel that he had just revealed and explained earlier in the letter (cf. Eph. 1:9-10; 3:3-4, 9; 5:32). *Four times Paul uses the Greek word pas ("all, every"), emphasizing the critical nature of prayer for all believers in the ongoing spiritual war. Furthermore, the sole reason that Paul was imprisoned, “an ambassador in chains” (6:20), was a result of boldly proclaiming God’s revelation about the mystery of Christ and the Church (Eph. 3:1; cf. Php. 1:12-14). Thus, even the apostle himself, highly esteemed and admired as he was, still enlisted the prayer support of his brothers and sisters in order to stand firm and not allow his “chains” to discourage him and hinder God’s will for his life (cf. Acts 20:24; Eph. 3:13; 2 Tim. 4:7). 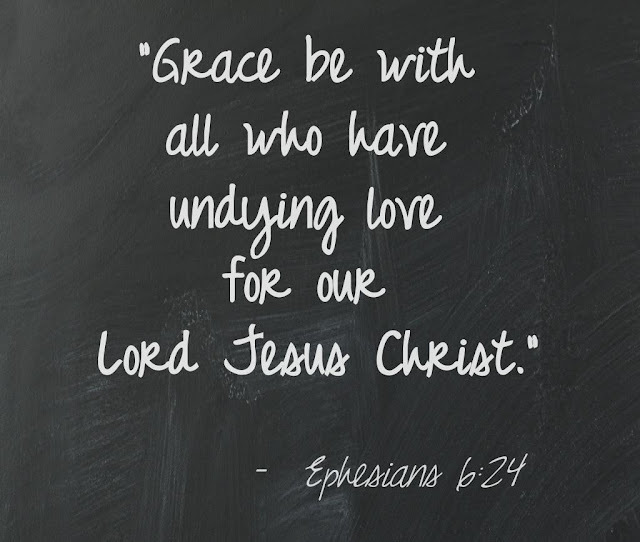 Paul’s closing words indicate that the Ephesians had a vested interest in the personal affairs of the apostle—they genuinely cared about his well-being and were concerned about how he was doing while under house arrest. Tychicus, also mentioned in the close of the letter to the Colossians (Col. 4:7-9), was most likely the one who delivered Paul’s letter to the Ephesians (cf. Acts 20:4; 2 Tim. 4:12). And just as Christ is said to proclaim “peace” to both Jews and Gentiles, who are members of His body (Eph. 2:14-17; 3:6; 4:3), the apostle Paul also proclaims “peace” to his brothers and sisters (6:23). Along with promoting and preserving peace, he desires that the Ephesians love faithfully (lit. “love with faith”) just like their Father and His Son, the Lord Jesus Christ. Lastly, Paul concludes with the same crucial word from his opening address, “Grace” (cf. Eph. 1:2). Thus, we have the perfect bookend to a letter that thoroughly emphasizes the grace of God at work in the lives of His adopted children (cf. Eph. 1:4-6; 2:4-10; 3:2, 7-8; 4:7). Given all that God has done for believers, in response, grace should then characterize and flow from the hearts of all those who faithfully love the Lord Jesus Christ. * Amen! *The Greek text of Eph. 6:24 reads literally, "The grace [be] with all those who love our Lord Jesus Christ with incorruptibility." Hoehner comments, "The Greek word aphtharsia ("incorruptible, imperishable") has the idea that believers' love for the Lord Jesus Christ is to be pure, not corrupted by wrong motives or secret disloyalty. Unfortunately, some Ephesian believers later did lose the fervency of their love for Christ; see Rev. 2:4" (645). “Victory against supernatural foes is achieved by divine empowerment in the form of God’s armor (commitment and dependence upon God) and by Spirit-driven prayer" (Kuruvilla, 218). Believers in Christ living on earth during these dark and evil days (Eph. 5:16; 6:13) must recognize and stand firm against the attacks coming from their true enemy. The adversary is not someone to be seen or observed by physical sight, because we literally cannot see the enemy plotting and executing his schemes, and nor can we determine with certainty when the evil day will strike us like a sudden storm. “In one sense, the ‘whole armor of God’ is a picture of Jesus Christ. Christ is the Truth (John 14:6), and He is our righteousness (2 Cor. 5:21) and our peace (Eph. 2:14). His faithfulness makes possible our faith (Gal. 2:20); He is our salvation (Luke 2:30); and He is the Word of God (John 1:1, 14)” (Wiersbe, 59). In summary of 6:10-24, believers are able to stand firm and hold their ground in the spiritual war, because they possess the six-pieces of the whole armor of God: belt-truth, breastplate-righteousness, shoe-peace, shield-faith, helmet-salvation, and sword-word—plus an implied seventh element—Spirit-driven prayer. When all of these are embraced and consistently applied in our lives, we can be confident of victory. God Almighty, the Most High, is our refuge and strength, and there is protection for all of His little ones underneath the shadow of His wing (Ps. 91:1-2, 4, 9). Therefore, since we are one with the Ruler of all (Eph. 1:20-23) and raised up and seated with Him in the heavenly places (Eph. 2:6-7), then who is left to fear? (Ps. 27:1). “Don’t be afraid, little flock, because your Father delights to give you the kingdom” (Luke 12:32). Stand firm, then, and fight the good fight of the faith until the kingdom comes. Hallelujah, amen! "Four times Paul uses the Greek word pas ("all, every"), emphasizing the critical nature of prayer for all believers in the ongoing spiritual war." Amen to that. We must pray unceasingly, now more than ever. It's crunch time! Gotta armor up and pray up. Great Amen Gary! Praying with! The Lord hears all our prayer! Great are You, LORD. You are worthy of all glory and honor and praise. I worship You. I praise Your holy name. Great is Your power. You call things into being that are not. How grateful and thankful I am to be Your child. To have opportunities to learn all You desire to teach me. In Christ, I have all that I need. All hope, peace, strength, love, patience, and endurance... even in impossible circumstances. I am free. But for you who revere my name, the sun of righteousness will rise with healing in its rays. And you will go out and frolic like well-fed calves. 3 Then you will trample on the wicked; they will be ashes under the soles of your feet on the day when I act,” says the Lord Almighty. LORD Jesus. With these things in mind, I call upon Your name to move and act. Crush my adversary under my feet. Utterly trample those that come against Your children. Be our peace. Affect this realm. Move heaven into it concerning what I am facing now, by the power of Your Holy Spirit. May Your name be glorified. Allow me to see it. I approach Your throne and ask all these things of You through the covenant of Jesus' blood, shed for me. So be it. And then I resume reading the rest of your post, eventually finding the last section "Application to the Body of Christ", and the perfectly picked last song from Chris Tomlin, which has special personal meaning to me. Immediate answer to prayer. Always amazed, never surprised. I believe this could not have happened if it were not for you and the rest of the unsealed team abiding in Christ (John 15). Wow, Daniel, thank you for sharing how God helped you today and modeling a heartfelt, Spirit-driven prayer. The Unsealed team will continue to abide! We want to be vessels that the Lord uses for His glory. Thank you Jeff very-very much for all this study! Studying with all this time! It's very interesting! 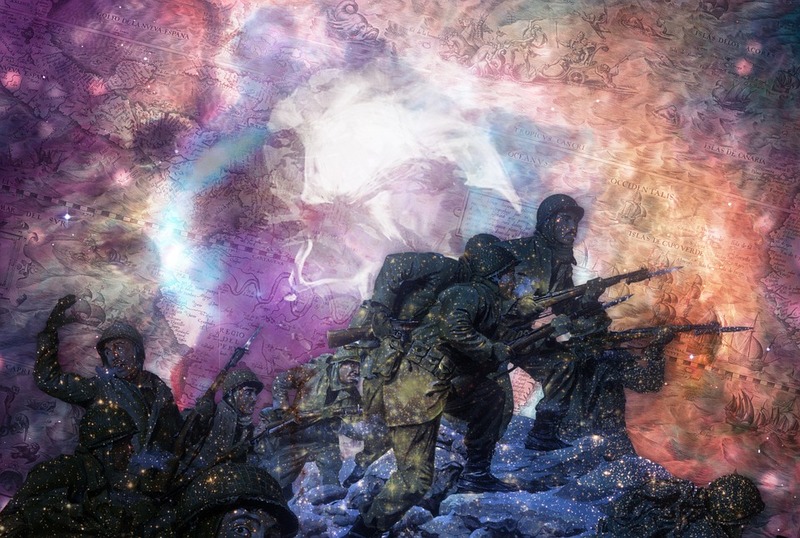 Making now a grate outline of this – from Grace till Spiritual War! And now the Lord Jesus comes for us quickly! Rev 2:25-26 (KJV) – Rev 3:21 (KJV) – Rev 4:1 (KJV). You are a great blessing indeed in the Lord! Amen! Maranatha! Thank you, sister Alla. You are a blessing too. Unbeknownst to him, Jeff finished this article right as I was entering some spiritual warfare of discouragement and disillusionment. God used it to right course. It's amazing how active God's Spirit really is. He's operating 24/7 if we would just open our eyes. Stay alert everyone. Keep your eyes peeled. The LORD is moving! Still reading this, brother, but just wanted to say THANK YOU. It is perfect timing. And I'm so thankful. Blessed to read this. Thank you, Hillary. Be strong in the Lord and the strength of His might! Jeff, thank you for all your hard work. This was truly a great study, delivered thoughtfully, I know the Holy Spirit is breathing life in the Saints and this study of God's holy Word in Ephesians has been so helpful in a time such as this. Thank you so much. This comment came at a good time!